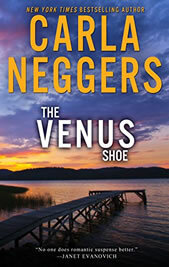 An early novel by New York Times bestselling author Carla Neggers now in eBook for the first time! Artemis Pendleton returns to the lakeside estate where she spent many happy days as a child, before the deaths of her parents. Alone with her memories, she picks wild blueberries on a quiet island. As she starts to dip into the cool water for a refreshing swim, she discovers she isn’t alone after all. A man is asleep on her little island. Artemis doesn’t believe his story about why he’s trespassing, but the truth is even more complicated. She is convinced this rugged stranger and his secrets are the key to finding out what really happened to her parents. She’s playing a dangerous game, not only with her life…but with her heart. As the questions mount, so do the dangers. But suddenly it’s not just about the threats Mark and Ann face. It’s about unexpected love and what they will do to save each other. Originally published by Avon Books as the launch title of the Velvet Glove romantic suspense series.